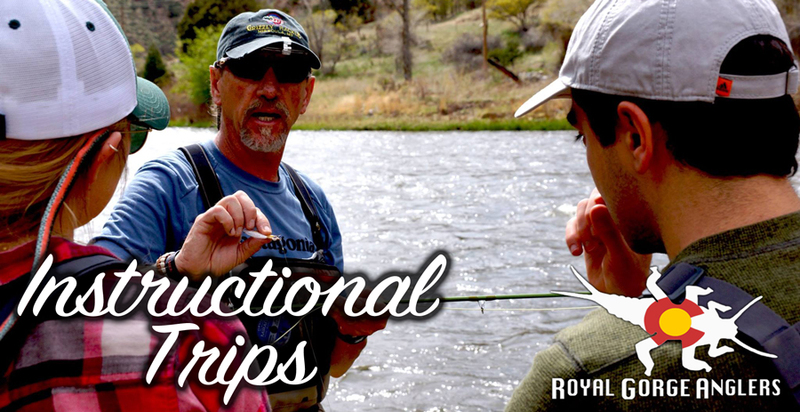 Teaching the sport of fly fishing to beginners is what we truly take pleasure in at Royal Gorge Anglers! The Introduction to Fly Fishing Course is a tried a true on the water workshop for those looking to build a "fly fishing tool box." Our guides' main objective in this full day course is to build an anglers skill set so that they can be confident on the water moving forward. We will always tell you, that the most important guide trip you ever take is the first one, so you learn good skills and habits on which to build on. Royal Gorge Anglers offers courses with some of the most experienced and qualified instructors in North America. This Full Day Course can also be customized for intermediate or experienced anglers to looking build desired skillsets. This is a great opportunity for all anglers. Wondering how to get your fly in that difficult little spot past the raging riffle...or how to rig a nymph or emerger rig for a specific season? Take 2 hours one on one with one of our fantastic Orvis Endorsed Guides to get your questions answered the right way...hands on! Whatever your pleasure let us know, then hit the river for the rest of the day to practice your newly learned techniques.